Highly concentrated zero water formula. All you need is just a drop! Ideal for extremely dry and cracked skin. This cream is a creation by proprietary blend of three most hydrating ingredients on earth, Cocoa butter, Lanolin (USP grade 25%), and Lactate (sodium lactate 12%). 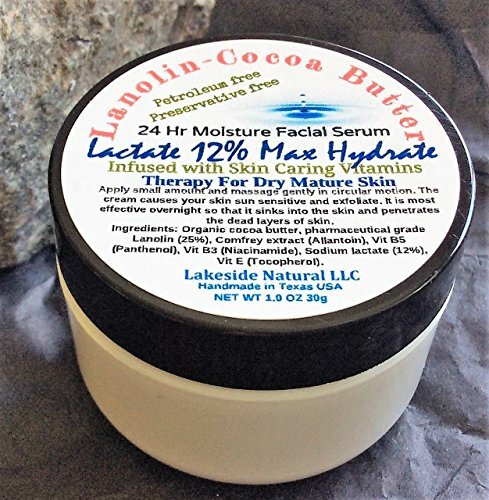 Lactate exfoliates thick rough out layer skin, cocoa better let vitamines and emollient penetrates deep into skin, and lanolin locks in moisture. This proprietary bridging technique requires no addition of chemicals such as binders, preservatives, or emulsifiers. It frees from the burdens of store bought chemicals. The formula contains more than 50% of organic cocoa butter 25% of Lanolin and it is not like other products made out of mostly water. A little goes a long way! Petroleum free, 100% Natural and Organic! Preservative and Dye free. Drug free and chemical free alternative therapy that is safe and effective. It frees you from the burdens of store bought chemicals. Handmade and formulated by pharmacist in Texas USA. * The product containing sodium lactate can cause skin sensitivity (photo sensitivity), so it is best to be used before bed at night or avoid sun and ultra violet (UV) light exposure. If you have any questions about this product by Lakeside Natural Apothecary, contact us by completing and submitting the form below. If you are looking for a specif part number, please include it with your message. Creamy Natural Foundation, Green Beauty liquid mineral foundation with light coverage, eco friendly, cruelty free mineral cream foundation that works for mature skin.